There has been a quiet revolution in boiler design that is slowly changing the face of the modern plant room in buildings across the UK. Manufacturers have responded to the requirement for improved heating efficiency and increased heat output within small plant rooms with a range of wall-hung and floor-standing boilers that offer unprecedented flexibility in system design. These boilers combine improved ease of installation and versatility with high-quality performance for maximum efficiency and minimum carbon emissions. Heating is the largest single end-user of energy in a building, accounting for around half its total energy consumption. New buildings are designed to require less heat, but our notoriously inefficient existing buildings continue to present a huge challenge for the building-services industry. With commercial boiler plant still supplying heat for a significant percentage of commercial buildings, the role of the modern boiler is key; not only does it play an important part in multi-technology systems, but simply replacing any inefficient boilers with high-efficiency condensing boilers is acknowledged to be one of the most effective and affordable means to achieving rapid energy and carbon savings. This is the catalyst for the ongoing innovation, refining and fine-tuning of boilers to achieve extended design options that are capable of accommodating the individual requirements of a building. Historically, a major obstacle to boiler replacement projects has been the size, shape and location of the plant room. For this reason, size really does matter with boilers. These boilers for the National Library of Wales were delivered on wheels for easier manoeuvrability and quick and easy installation to minimise disruption. Floor-standing boilers are traditionally the boiler of choice for projects requiring high heat output. Manufacturers have addressed the issue of size by introducing floor-standing boilers that are lighter and more compact than before, specially designed for quicker, faster installation. Look for boilers that are slim enough to fit through a standard doorway or delivered on wheels for easier manoeuvrability into and around the plant room. Potential obstacles such as stairways or narrow corridors are easily overcome with boilers that can be dismantled into parts to be reassembled later inside the plant room. This feature is particularly beneficial for refurbishing basement plant rooms. Refurbishment projects frequently require increased heat output to meet the present demand of the building, often as a result of inadequate sizing or extensions to the original building. The smaller footprint of today’s floor-standing boilers helps overcome this challenge, enabling boilers delivering a higher heat output to be installed into the same — or smaller — space than the original boilers. With floor-standing boilers, there is the option to install a single boiler or operate a series of fully-modulating boilers in modular configuration. This second solution can increase efficiency as it enables the boilers to be run at low loads to achieve the required heat output. Where space is restricted, opt for floor-standing boilers with back-to-back or side-to-side configuration options for increased flexibility of floor planning design. For projects requiring lower heat outputs, wall-hung boilers are a popular choice due to their extremely compact, lightweight design. Their smaller dimensions offer increased ease of installation as they are easier to move and position within the plant room and enable a smooth changeover, making them particularly suitable for buildings like care homes or schools that require continuous heat supply. A key advantage of wall-hung boilers is their ability to be installed on a prefabricated cascade or rig unit that can be wheeled into the plant room for rapid, easy connection to the existing system. Not only does this reduce on-site labour and minimise disruption, but, as with floor-standing boilers, the ability to operate multiple boilers in cascade improves the overall efficiency of the heating. The inbuilt redundancy of this solution provides greater reliability should one of the boilers fail, while also enabling easier, non-disruptive maintenance work. The small footprint of these rig and cascade systems means that they will often occupy only a fraction of the space of the previous boilers, even freeing up valuable extra space for the building operators or owners. With the introduction of large wall-hung boilers with an output of up to 160 kW, there is still greater choice for increased heat output in small plant rooms. Some manufacturers also offer the option to operate these large wall-hung boilers in a multi-boiler cascade system combined with lower output models, providing added flexibility of design. 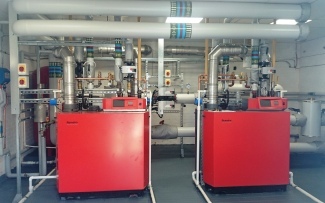 These boilers installed in a cascade system reduced gas consumption by £3000 in just four months. With modern condensing boiler technology and design, plant rooms are becoming a mini work of art. To understand the full impact of this greater versatility, let’s consider an application that requires 1 MW of heat. No longer is there just one feasible solution, as the examples below demonstrate. • A single floor-standing boiler. 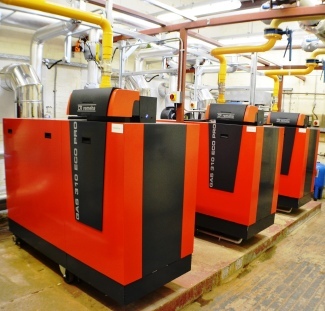 • A small bank of floor-standing boilers. • Ten 100 kW wall-hung boilers in cascade. These examples are just three of the many options that will achieve the same heat output, with personal preference rather than necessity dictating the system design. With their compact size, intelligent engineering and inbuilt flexibility, today’s boilers are enabling specifiers to design high-performance heating systems that tick all boxes, delivering maximum energy and carbon savings and new visual appeal. It’s time to make sure your plant room is on trend. James Porter is sales director at Remeha Commercial.